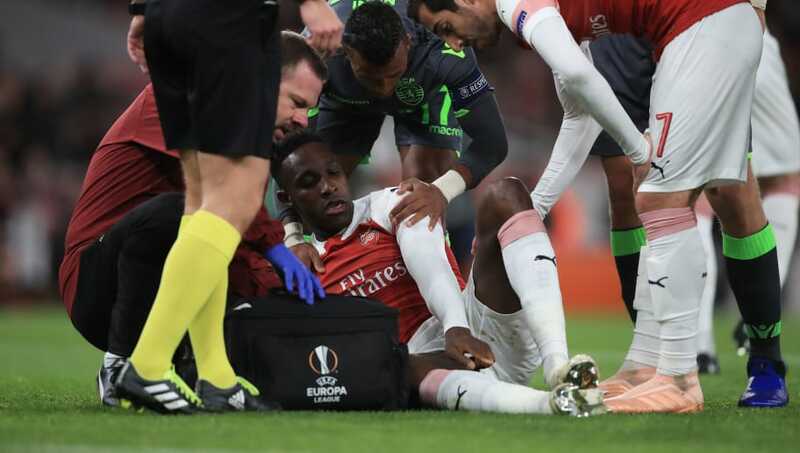 Danny Welbeck looks to have suffered a serious injury after getting stretchered off the pitch during Arsenal's Europa League fixture against Sporting CP. The English forward jumped for a header with Bruno Gaspar in the first half and came down awkwardly. Danny Welbeck looks like he's getting oxygen as he lies stricken in Sporting's penalty area. Leg brace being applied. Guendouzi has his hands on his head and can hardly bear to watch. Appears to be serious. Aubameyang coming on. The Arsenal forward attempted to get back up but was unable to do so on his own, prompting Arsenal medics to rush to his aid. He was administered oxygen before being stretchered off the pitch. Welbeck, who appeared to be in real pain, was consoled by former Manchester United teammate Nani and was given an effusive reception as he was taken off the field of play. BT Sport did not show replays of the incident due to the nature of the challenge and injury. But it is believed that Welbeck broke his leg - something which is likely to keep him sidelined for the remainder of the season - based on the reactions of the players around him. ​Pierre-Emerick Aubameyang was sent on to replace his stricken teammate, who has historically struggled with injury problems. Welbeck's teammate Mesut Ozil has since taken to Twitter to wish the attacker a speedy recovery. Arsenal fans and spectators have also taken to social media as they reacted to the painful injury suffered by the Gunners' winger. Blimey that looks horrific injury to Danny Welbeck.